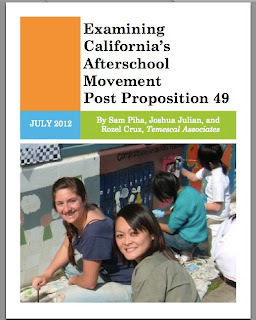 An insightful study on Proposition 49—California’s landmark piece of legislation that helped to bring school-based afterschool programs to more than 400,000 children across the state—was released at the end of last month. 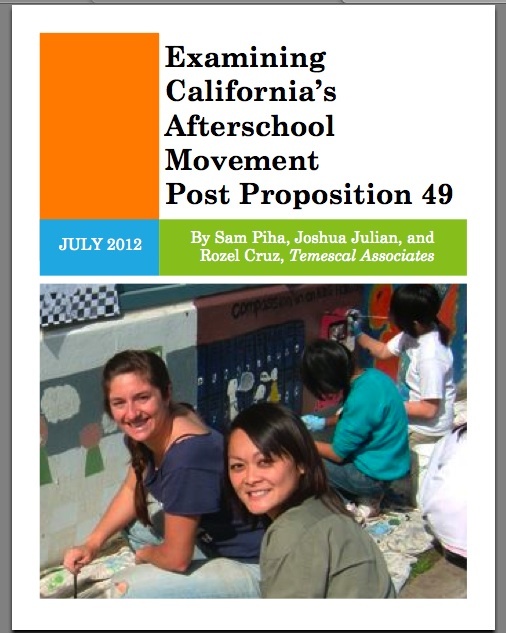 “Examining California’s Afterschool Movement Post Proposition 49,” a new research paper by Temescal Associates, discusses the implementation challenges and successes of Proposition 49, reviews the current afterschool landscape in California and offers recommendations to afterschool stakeholders as they move forward in an increasingly challenging economic environment. In addition to the valuable background on Proposition 49, I found that the study was able to capture the importance of research and evaluation in promoting afterschool. As a self-proclaimed data junkie, I appreciate the call for more research to better understand the role afterschool programs play in enriching the lives of children and helping working families; balanced with the recognition that to make this possible, clear and apt evaluative criterion must be established and it is essential that appropriate measurement tools and resources are available. The ability to maintain adequate funding is of significant concern among afterschool programs that are currently facing a state budget deficit, increased competition for state funds and reduced funding from foundations and philanthropic organizations. A number of evaluations have found that participation in afterschool programs have a positive impact on academic outcomes for students—such as improving student attendance, graduation rates and test scores—as well as positively influencing student behaviors—such as children in afterschool programs developed important life skills and social skills and were less likely to be suspended than youth who didn’t participate in programs. More resources need to be dedicated to research in the afterschool field and additional conversations need to take place to develop clear and sound criteria by which to measure the effectiveness of afterschool programs. Dedicating additional resources to provide assistance with program capacity building, program quality assessment tools and program improvement processes. Nikki joined the Afterschool Alliance in June 2012, where she works with the Vice President of Policy and Research to coordinate and implement annual research activities, design surveys on pressing issues in the afterschool field and analyze research findings, communicating the need for and great successes of afterschool programs to policy makers, afterschool providers and advocates, and the public. Prior to joining the Afterschool Alliance, Nikki served in a variety of research capacities, including as Policy Advisor at Third Way, where she handled a wide range of domestic policy issues such as juvenile justice, and as legislative assistant to former Rep. Hilda L. Solis, where she handled education and youth issues. She holds a B.A. in Political Science and Sociology from the University of California, San Diego, and a Masters in Public Policy from University of Southern California’s Sol Price School of Public Policy. It's really good to hear that there are efforts that aims to provide interactive activities and projects targeting children's awareness to a certain field such as environment-related and health-related concerns. Actually the occupational hygienist I talked to about said that they are really forming an organization that would help kids develop the inner sense of responsibility among themselves that's why they have these sort of projects.